By author: Robert D. Jenkins Sr.
To the Gates of Atlanta covers the period from the Confederate victory at Kennesaw Mountain, 27 June 1864, leading up to the Battle of Peach Tree Creek, 20 July 1864, and the first of four major battles for Atlanta that culminated in the Battle of Jonesboro, 31 August and 1 September 1864. To the Gates of Atlanta answers long-sought mysteries surrounding the actions, the reasoning, and the results of the events that culminated into the fall of Atlanta and the end of the Confederacy. Many historians point to the events that led to the fall of The Gate City as central to the War’s outcome. Readers will learn why President Davis believed that he had to replace General Johnston on the eve of a battle that he hoped would save the city and turn the tide of the War for the South. 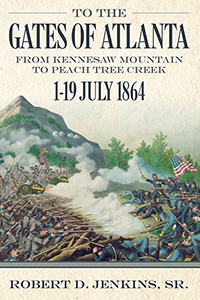 Jenkins offers an understanding of why General Sherman had to take the city quickly without risking another disastrous Kennesaw Mountain. To the Gates of Atlanta also gives the important, but previously untold stories of the actions and engagements that befell the sleepy hamlet of Buckhead and the surrounding woods that today shelter many parts of Atlanta’s vast community. From Smyrna to Ruff’s Mill, Roswell to Vinings, Nancy Creek to Peach Tree Creek, and Moore’s Mill to Howell’s Mill, To the Gates of Atlanta tells the story of each as part of the larger story which led to the fall of The Gate City of the South.